*** Dimensional Stitches: This industry-first, patent-pending feature allows sewers to add applique fabric or pop-up effects for one-of-a-kind decorating capabilities. *** deLuxe™ Stitch System: Another industry-first, this innovative feature enables sewers to effortlessly use any specialty thread on any fabric type while eliminating time-consuming manual adjustments. *** Ultimate Interactive Screen: Navigation is easier than ever with wider viewing angles and more radiant colors. *** Included Interchangeable Dual Feed: Ensures a perfect, even feed when quilting or sewing with tough fabrics like leather or stretchy material. 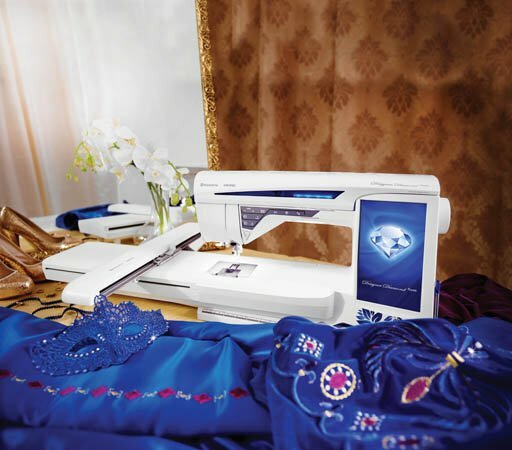 *** Faster, more efficient embroidery: Decreases embroidery time by 20 percent or more.